I have to say that I enjoyed participating in my first Snapshot Saturday. It seems that the people who participate like to check out what the other participants are showing as their snapshot and leave encouraging comments. I hope to continue participating. My morning at Weight Watchers was positive also. I lost a half pound and it puts me closer to my personal goal. I’m below my WW goal already, but like so many other members, I have my own goal in mind. I’m close to being back there and it will be especially exciting if I can get there during the Holidays. Proof to myself and anyone else who is working to achieve weight loss goals that you don’t have to let the Holidays be a road block in your efforts. I knew every word and every arrangement for Every song on the record. If I listened to it once, I listened to it 100 times! Probably more. It always made me happy and always got me into the Christmas spirit. It was easier back then for me to get into the spirit. It’s been hard for me to get into the Christmas spirit for the last few years. Various things are responsible for that, none of which I don’t need to discuss here. But the good thing is I feel I’m turning around. In the car, I would consciously avoid turning on one of radio stations that does all Christmas music all the time from Thanksgiving on. While driving the other day, I found myself searching out one of the stations, wanting to hear the music. I don’t even think I was aware it was happening. Then last night Andy Williams turned on the light bulb for me. Seeing Andy and his brothers and his family, along with the Osmond brothers did it for me. Funny how things that sit in the back of your memory can suddenly come forward and make a difference. Happy Sunday…I WILL start the Christmas cards today! This entry was posted in Uncategorized and tagged Holiday Hub Bub, Weight Watchers. Bookmark the permalink. fran, i am glad to hear that you are finding the christmas spirit – hugs! ok, LOVE that last photo because of andy’s SWEATER!! i hope you have a great sunday – good luck with your cards! i just really enjoyed reading your thoughts, in general, right now – thanks for sharing! Hugs back to you, Cathy! Funny, although I wasn’t thinking of you specifically, something drew me to the photo with the sweater! Glad you like it and that you like the post. Have a great day! 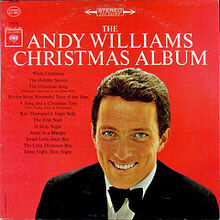 Glad Andy is helping you get in the mood for the holidays! Congrats on WW and good luck on your cards. I have to do mine too. I have them, but need to get them out! Yes, Andy has the knack, that’s for sure! Ralph does the artwork for our cards so we had to wait for him to finish them and then have them printed. I’m excited about them. After I get them in the mail, I’ll scan it and show everyone! Ok, Dana! Seems like I’m not the only one who’s sluggish!! Have a great Sunday! Saturdays are usually never productive for me…Sundays are the day I get things done! I hope that you get your cards out today. I’m going to try to do the same. I’m about a third into them, Ameena, so I’m pretty excited! Enjoy your productive day! !